Bringing a smile to passersby and encouraging the tourists into their shop, The guys at Cool Britannia in Piccadilly have the most novel ways to sell their souvenirs. Doing a great job whether for England or Britain!!! Yes, how much fun is this?! 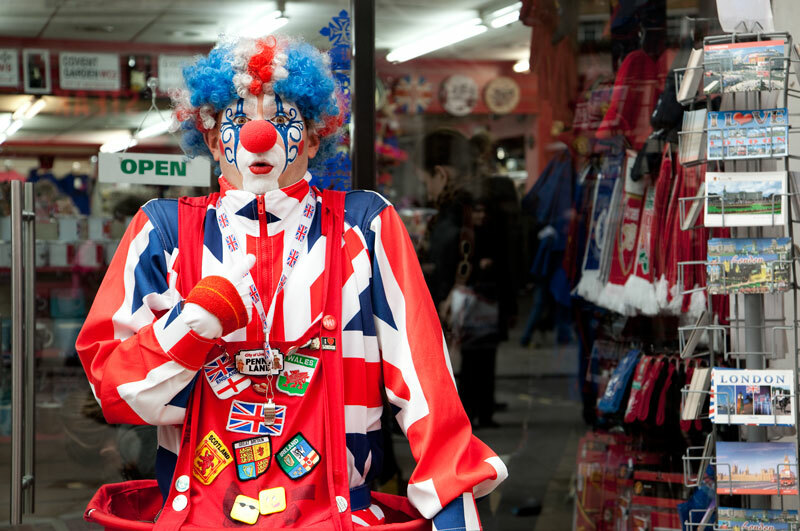 Clowns always get my attention, and I'd certainly be tempted by this one to enter the shop and look around! Cute! I've dropped into many of these stores on my visits to London. If I were shopping for cheap crap souvenirs (which is an essential tourist activity), I'd skip right past this annoyance. Though I'd be tempted to slow down long enough to kneecap this muppet. 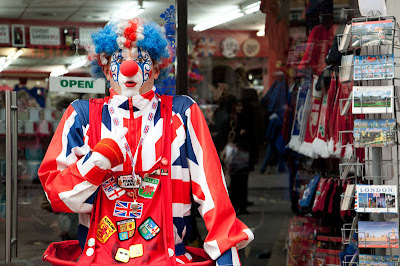 @Adullamite - Mr Cameron is dressed in full British regalia - there's nary an English flag in sight. He must definitely give that shop an edge!